Ah, where to begin. Okay, so I got a job and started on the 2nd which is great because it means I'll be making more money and will have a bigger costuming budget. The not as great part is that I work between 12 and 4, 4 days a week which takes away some of my time that I would spend on costumes. So my costuming progress may be a little slower. Although this week I have gotten a bit done on my Christine wig! Which brings me to my next 'update'. I took a break from working on this because I ripped out 7 wefts and replaced them with the new long wefts only to realize I stitched them in too tight making it so the wig didn't fit my head properly. So I had to rip out all 7 of the wefts and stitch them back in again. But I got it done and that's the important part, right? I also found it's much easier to do your wefting with your wig on a wig head. Before I just held it in my hands and hair was getting all tangled and in the way. It's much easier to do it on a wig head. The wig I got was curly and the new wefts are super straight, so when it's down it looks ridiculous! 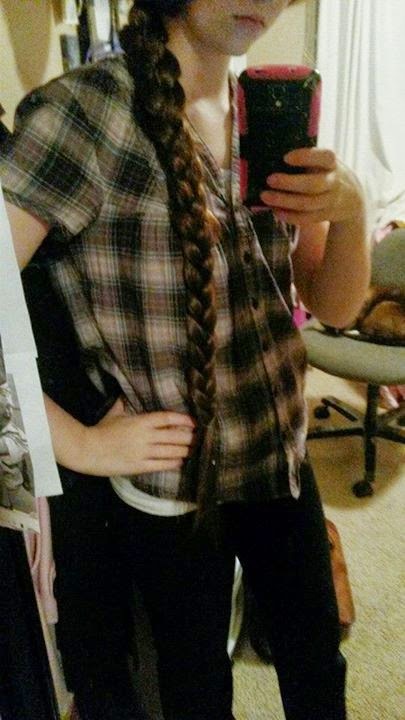 I braided it before putting it on to get a look at the length, and this is what it looks like. Sorry for the poor quality, it was dark and I didn't want to wait 'till the next day to get a picture. The braid is almost a yard long! I'm doing some curling tests with some left over wefts to find the best method for curling this thing, I tried putting it in foam curlers and then using the hairdryer to get it warm. But it didn't really work. So now I'm trying it with boiling water. I also want to find out how long the curls will last. I've heard that synthetic hair will hold curls for a long time, which would be really nice! So once I find the method I like I'll be testing that. Okay, the last thing is actually a question for all of my followers. I've been thinking for a long time about starting a costume vlog. I haven't come across anything like that before and think it would be kind of cool. I've never done a vlog before and have thought about doing it but I don't think I would have enough to put in for my everyday life. But I would have a lot more content if it were a costume vlog because it's something I'm really passionate about. So what do all of you think? Should I give it a go? Hi! I only found your blog a few days ago and I love it! 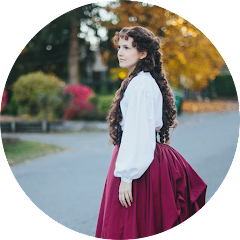 I love the idea of a costuming vlog. It sounds like it could be really cool. Can't wait to see more of your Christine costume. I have never seen The Phantom of the Opera but I have always thought that it a really gorgeous costume.